Aim: This study aimed at determining the prevalence of Insulin Autoantibody (IAA) and Islets cell Autoantibody (ICA) in Edo State, Nigeria. Method: Insulin Autoantibody (IAA) and Islets cell Autoantibody (ICA) levels were estimated using ELISA reagents from Biomerica Inc. Other parameters such as fasting blood sugar, urine glucose, and urine protein were assessed using standard colorimetric and biochemical techniques. A total number of four hundred and fifty five (455) subjects, 211 (46%) males, and 244 (54%) females with ages ranging between 5 – 76 years were assessed. Subjects were free from long standing illness, endocrine disorder and infectious diseases. Most of the subjects were those attending diabetes clinics in secondary and tertiary Institutions in Edo State, relatives of type I diabetics and volunteered controls. A structured questionnaire was used to collect sociodemographic data. Sociodemographic data included age at diagnosis, age at inclusion, gender, family history of diabetes, drinking and smoking habits, and the duration of diabetes. In cases of patient uncertainty the duration was calculated from the documented date of diagnosis. Other information was obtained from the patients’ files, including the mode of presentation, type of treatment, and course of the disease. RESULTS: The prevalence of IAA in the study population is 100% in Type I diabetics, 10% in Type II, 26.7% in diabetic relatives, 1.6% in non-diabetic control, while 11. 9% represents the prevalence of IAA in the general population. ICA also has 100% prevalence in Type I diabetics, 10% in Type II, 26.7% in diabetic relatives, 2% in non-diabetic controls, and 12.1% in the general population. CONCLUSION: The seroprevalence of ICA and IAA is high in this study, public enlightenment, change of life style and early routine check is advocated to prevent diabetes development, complications and reduce mortality rate. while the Type 2 results from non-production of insulin or insufficient circulating insulin. 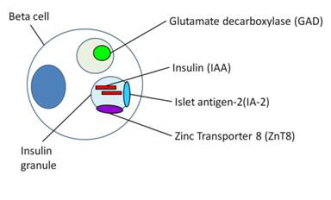 Insulin autoantibodies (IAA) are one of several markers for Type 1 (autoimmune) diabetes. Unlike the other markers, their legend is unique to the beta cell (4). IAAs are the first markers to appear during the symptomless period which precedes diabetes and they are present in the vast majority of young children destined to develop diabetes (4). They are present at titres which relates inversely to age at onset of IDDM (5) (6), and are believed to mark for the rapidity of progression to the disease. Thus, IAA are rare in IDDM of adult onset, which is generally of slow progression, but present almost universally in children who develop diabetes below the age of five years (6), where progression is typically rapid. The origins of IAA, and the timing of their appearance in the circulation, are however unknown. Nevertheless, the rare description of congenital IDDM where the infant, but not the mother, is seropositive for islet related autoantibodies including IAA (7) indicate that insulitis can begin during gestation. Recent studies in humans and in animal models of spontaneous insulin-dependent diabetes have demonstrated the presence of islet cell cytoplasmic antibodies (ICA), islet cell surface antibodies (ICSA) and insulin autoantibodies (IAA) during a prolonged but relatively asymptomatic pre-diabetic period (8)(9)(10)(11)(12)(13)(14). Most studies evaluating immune markers for prediction of Type 1 diabetes mellitus have focused on first degree relatives, although only 10% of newly diagnosed patients have affected first degree relatives. A previous study (15) has reported a significant association of IgG IAA with ICA – positive in first-degree relatives of Type 1 diabetics. Several attempts have been made to determine the prevalence of diabetes by surveys of community. Most surveys have shown that there are about as many unknown diabetes as known cases. individuals in the general population, the siblings, and families of IDDM patients, who are at a high risk of developing this disease because of their genetic predisposition to diabetes hence the need for this study. This study was conducted at Central Hospital, Benin City. The subjects included 55 diabetic patients on appointment visit to diabetic clinic and those on admission; 150 relations of the type 1 diabetic patients; 250 volunteer controls and a general population of 455 participants. Participants’ consents were obtained before participation in the study. Ethical clearance was obtained from the Ethical Committee of Central Hospital, Benin City, Edo State, Nigeria. Patients were classified as Type 1 or Type 2 according to the clinical criteria recommended in the 1997 World Health Organisation(16). Classifications were based on age at diagnosis, mode of onset (acute versus insidious presentation), duration of disease, current treatment, BMI, waist-to-hip ratio, blood pressure, random or fasting glucose, HbA1c and urine ketones. A classification of Type 1 diabetes was defined by the following criteria: onset in patients aged 30 years or less, presentation of acute classical symptoms, and that required insulin therapy to control hyperglycaemia. A classification of Type 1 diabetes was also designated to patients older than 30 years that required insulin treatment, lacked metabolic control, and were determined to be underweight. A classification of Type 2 diabetes was designated to patients who were older than 30 years at diagnosis and did not need insulin for metabolic control. A Type 2 classification was also designated to patients younger than 30 years who were obese and had diabetes for a long duration without requiring insulin treatment. Patients that did not clearly exhibit the clinical features of either Type were classified as undetermined and excluded from the present analysis. Ten millilitres of blood was collected intravenously, five millilitres was dispensed into a plain container, and the other five millilitres glucose and protein were immediately detected qualitatively using Combi – 9 strip. Statistics was done using Statistical Package for Social Sciences program (SPSS) version 16.0. Values obtained in this research were represented as mean ± Standard error of mean (SEM) for continuous variables and percentages for categorical variables. Analysis of variance (ANOVA) was used to compare data at 95% confidence interval (p<0.05). was dispensed into a fluoride oxalate container. The blood samples were spun at 1500rpm for 10minutes and the supernatant serum/plasma were separated into separate tubes. . The serum/plasma samples were stored at -200C for up to 2weeks prior to the analysis of fasting blood glucose and antibodies. IAA and ICA were determined using ELISA reagents from Biomerica Inc., U.S.A. Blood glucose was determined colorimetrically using Randox kits from United Kingdom. Fresh urine samples were voided into clean sterile containers, glucose and protein were immediately detected qualitatively using Combi – 9 strip. Tables 1 and 2 show the general prevalence of IAA (n = 54) in the general population (n = 455) to be 11.9% while the prevalence of ICA (n = 55) in the general population is (n = 455) is 12.1%. However, in diabetic Type 1 population (n = 5), the prevalence of ICA and IAA is 100%. In Type 2 diabetic population, the prevalence of IAA (n = 50) is 10%, while ICA (n = 50), is 10% (n = 50) respectively. Diabetic relatives population of IAA and ICA (n = 150) have a combined general prevalence of 26.7% (n = 40). However, the general population prevalence of IAA (n = 250) and ICA (n = 250), are 1.6% (n = 4) and 2% (n = 5) respectively. Most studies on the role of autoimmune markers in the pathogenesis of type 1 (insulin – dependent) diabetes mellitus have focused on first degree relative. Although, the risk for type-1 diabetes is increased among relatives, it is likely many of them may have a reduced acute insulin response to glucose (17, 18). The present study indicated 26.7% prevalence of both IAA and ICA in relatives of type 1 diabetic patients. Another study, (19) in London among English school children found prevalence of 2.8% and 6.8% respectively in the population and siblings of the diabetic patients. The work carried out by a researcher (20), at Malmon, Sweden in a study of a heterogenous group of high risk subjects (non-diabetic patients genetically at higher risk for IDDM including discordant monozygotic twins and ICA positive first degree relatives), IAA were detected in 31% of ICA positive individuals. The present study indicated 100% prevalence of IAA and ICA in the diabetic type 1 patients and 10% prevalence in type 2 diabetics for the two antibodies respectively. In addition, we observed 1.6% prevalence of IAA and 2.0% of ICA in non-diabetic controls. Our finding is not in agreement with some workers (21), who found the prevalence of IAA in 18% of newly diagnosed IDDM patients. But with an improved radiometry antibody assay, they found approximately 40% of fresh onset, untreated IDDM patients. The reason may be due difference in the methodology. Similarly, our study did not agree with a previous study (22) which found 2 out of 68 diabetics and 1 out of 68 controls among Nigerian diabetics have ICA. Some workers (23), (24), (25), (26), (27), (28), have also reported prevalence of 20 – 50% among newly diagnosed IDDM patients in Pasco Country, Florida, USA. However, with an improved radiometry antibody assay, they found approximately 40% of fresh onset, untreated IDDM patients. The reason may be due differences in methodologies. The 100% prevalence observed in IAA and ICA in this study may be due to the fact that the patients have all commence the administration of exogenous insulin. Our data also indicated 11.9% prevalence of IAA in the general population. This is at variance with the work of some researchers (29), who reported the prevalence of IAA to be 4% among 1031 populace in Sweden. Also the prevalence of ICA in the general population (n = 455) is 12.1%. This is at variance with the work of (30) who found the prevalence of ICA to be 6.8% among Tanzanian Africans. Another previous study (29) also found 1.4% prevalence of ICA in a Swedish population. It is believed that the variations in prevalence in this work relative to other previous works may be due to differences between the Africans and Caucasians in terms of diet, climate, method of diagnosis and other etiological factors that trigger the onset of the diabetes mellitus. However, to the best of our knowledge, this is the first documented work to evaluate combined IAA and ICA measurements among African populations either with diabetes or without diabetes. The seroprevalence of ICA and IAA are high in this study and their occurrence are almost at the same rate in all the groups, it shows that categorising diabetes into type 1 or 2 on the basis of ICA may generally not fit the pattern of diabetes as seen in Nigeria and possibly other parts of the tropics. Though there is no plan for follow up on this work, if those positive IAA and ICA individuals are followed up, majority of them may eventually develop the disease, which brings us to the need to advocate for early routine check up and vigorous public enlightenment to avoid development of diabetes mellitus, which may lead to complications and subsequently mortality. 1. Fajans S.S., Cloutier M.C. and Crowther R.I. Clinical and Etiologic Heterogeneity of idiopathic Diabetes Mellitus. Diabetes; (1978); 27:11- 12. 2. Lynch M.J., Raphael S.S., Mellor L.D., Spare D.D. and Inwood J.H.M. Medical Laboratory Technology and Clinical Pathology 2ndEd. W.B Saunders Co. (Philiadephia), (1969); pp367. W.B. Saunders Co.(Philadelphia); (1974):pp 553. 4. Eisenbarth G.S.T. Type 1 diabetes mellitus.A chronic autoimmune disease. N.Engl J. Med. (1986); 313: 1360 – 1368. 5. Vardi P., Ziegler A.G., Matthews J.H., Dib S., Keller R.J., Ricker A.T., Wolsdrof J.H., Herskowitz R.D., Rabizadeh A., and Eisenbarth G.S. The concentration of insulin autoantibodies at onset of Type 1 diabetes; inverse log-linear correlation with age.Diab.Care; (1988); 11:736-739. 6. Karjalainen J., Salmela P., Ilonen J., Surcel H.M. andKmp M.A comparism of childhood and adult Type 1 diabetes mellitus.N.Engl J. Med. (1988); 320: 881-886. 7. Dotta F., Gillio C., Fanilla C., Moretti A., Bosco N., Sulli P., Colarizi C., Tiberti E., Anastasi G. and Di Mario U. Autoimmunity to pancreatic ß cells in congenital diabetes mellitus.Diabetologia. (1996); 39 (suppl 1): A97. 8. Gorsuch A.N., Spencer K.M., and Lister J.The natural history of Type 1 diabetes mellitus: evidence for a long prediabetic period. Lancet. (1981);2: 1363-1365. 9. Betterie C., Zanette F., Tienoo and Trevban A. Five year follow-up of non-diabetes with islet cell antibodies.Lancet II;(1982): 284. 10. Beakkoskov S., Dyrberg T. and Learnmark A. Autoantibodies to a 64-kilodalton islet cell protein precede the onset of spontaneous diabetes in the BB rat. Science (1984); 224:1348. 11. Dyrberg T., Poussier P., Nakhooda F., Marliss E.B. and Lernmark A. Islet cell surface and lymphocyte antibodies often precede the spontaneous diabetes in the BB rat. Diabetologen, (1984); 26: 159. 12. Srikanta S., Ricker A.T., McCulloch D.K., Soeldner J.S., Eisenbarth G.S., and Palmer J.P. Autoimmunity to insulin, beta cell dysfunction, and development of insulin-dependent diabetes mellitus. Diabetes; (1986); 35:139-142. 13. Takei I., Maruyama T., Taniyama M. and Kataoka K. Humoral immunity in the NOD mouse. In insulitis and type 1 diabetes Lesson from the NOD mouse (ed by Tarui Y. Tochino and K. Nonaka). Academic Press. Tokyo. (1986); pp 101. 14. Reddy S., Bibby N.J. and Elliot R.B. Ontogeny of islet cell antibodies, insulin autoantibodies, and insulitis in the non-obese diabetic mouse. Diabetologia, (1988);31:322. 15. Dean B.M., Becker F., McNally J.M., Tarn A.C., Schwartz G., Gale E.A.M. and Bottazzo G.F. Insulin autoantibodies in the pre-diabetic period correlation with islet antibodies and development of diabetes. Diabetologia.(1986);29:339-342. 16. W.H.O. The Expert Committee on the Diagnosis and Classification of Diabetes Mellitus: Report of the Expert Committee on the Diagnosis and Classification of Diabetes Mellitus. Diabetes Care 20: 1183–1197, 1997. 17. Srikanta S., Ganda O.P., Jackson R.E., Gleason M.E., Kaldany M.R., Garovoy E.I., Milford C.B., Carpenter B., Soeldner J.S., and Eisenbarth G. S. Type 1 diabetes mellitus in monozygotic twins: chronic progressive beta cell dysfunction. Annals Int. Med. (1983); 99:320-326. 18. McCulloch D.K., Klaff L.J. and Kahn S.E. Non progression of subclinical ß-cell dysfunction among first degree relatives of IDDM patients 5 years follow up of the Seatle family study. Diabetes, (1990); 39:549 – 556. 19. Bingley P.J., Bonifacio E., Shattock M., Gillmor H.A., Sawtell P.A., Dunger D.B., Scott R.D.M., Bottazzo G.F., and Gale E.A.M.Can islet cell antibodyies predict IDDM in the general population? Diabetes Care, (1993); 16:45-50. 20. Osson M. L. Sundkvist G. And Lernmark A. Prolonged incubation in the two colourimmuno fluorescence Test increases the prevalence and titres of islet cell antibodies in Type 1 (insulin-dependent) diabetes mellitus. Diabetologia, (1987); 30(5): 327-332. 21. Palmer J.P., Asplin C.M., Clemons P., Lyen K., Tatpati O., Raghu P.K. and Paquette T.L. Insulin antibodies in insulin dependent diabetics before insulin treatment. Science (Wash DC), (1983); 222:1337-1339. 22. Oli J.M., Bottazzo G.F., and Doniach D. Islet cell antibodies and diabetes in Nigerians.Trop Geogr Med. 1981; 33:161–164. A.L. Correlates of insulin antibodies in newly diagnosed children with insulin-dependent diabetes before insulin therapy. Diabetes, (1985); 34:926-930. 24. Bergman S., Ludvigsson J., Binder C. and Mandrup – Poulsen T. Insulin antibodies before treatment in ICA – positive children with IDDM. Diabetes Res. Clin Practice Suppl. (1985); 1:45. 25. Wilkin T., Armitage M., Casey C., Pyke D.A., Hoskins P.J., Rodier M., Diaz J.L., and Leslie R.D.G.Value of insulin autoantibodies as serum markers for insulin dependent diabetes mellitus. Lancet. (1985); 1:480-482. 26. Atkinson M.A., Maclaren N.K., Riley W.J., Winter W.E., Fisk D.D. and Spillar R.P. Are insulin autoantibodies markers for insulin-dependent diabetes mellitus? Diabetes.(1986);35:894. 27. Karjalainen J., Kmp M., Mustonen A., Ilonen J. and Akerblom H.K. Relation between antibody and complement fixing islet cell antibody at clinical diagnosis of IDDM. Diabetes, (1986); 35:620. 28. McEvoy R.C., Witt M.E., Ginsberg-Fellner F. and Rubinstein P. Anti-insulin antibodies in children with Type 1 diabetes mellitus: genetic regulation of production and presence at diagnosis before insulin replacement. Diabetes, (1986); 35:634-641. 29. Samuelsson U., Ludivigeon J., and Sundikvist G. Islet cell antibodies (ICA), insulin antibodies (IAA), islet cell surface (ICSA) and C- peptide in 1031 school children in a population with a background incidence of IDDM. Diabetes Res. Clin.Pract. (1994); 26 (3) : 155-162. 30. McLarty D.G., Athaide I., Bottazzo G.F., Swai A.M., and Alberti K.G. Islet cell antibodies are not specifically associated with insulin-dependent diabetes in Tanzanian Africans. Diabetes Res ClinPract.1990; 9:219–224.